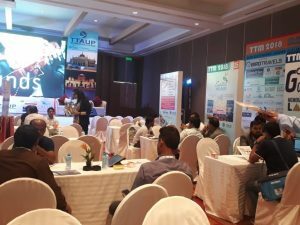 The Travel Trade Association of Uttar Pradesh (TTAUP) organised the second edition of Travel Trade Mart (TTM) 2018 at Hyatt Regency, Lucknow. Around 161 travel trade professionals from Lucknow, 22 from Kanpur, 18 from Varanasi, 44 from across UP and 85 metro cities attended the event. As many as 36 exhibitors showcased their products to travel agents and tour operators of UP. The exhibitors encompassed all segments of tourism and hospitality. Awanish Kumar Avasthi (IAS), Additional Chief Secretary and Director General, Department of Tourism, Government of Uttar Pradesh, inaugurated the mart. In his address, he said, “These regional travel trade shows are integral to the overall growth of the tourism sector in the state of Uttar Pradesh and should be organised more often.” Vivek Pandey, Pesident, TTAUP along with other office bearers of the association welcomed the chief guest and travel tradae partners from across the country.